The New Baby and Me out NOW in paperback! You are here: Home / The New Baby and Me out NOW in paperback! 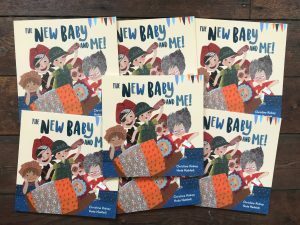 Fans of fab stories about exciting new siblings have cause to celebrate as The New Baby and Me has just been released in paperback! Five brothers all have high hopes for their new baby brother. Perhaps he will be an explorer and trek around the jungle garden. Or, he could be a scientist, spending his days creating bangs and puffs of smoke. All the brothers do know is that the new baby will be just like them! But, when the new baby arrives they are in for a very big surprise. The New Baby and Me is illustrated by the wonderful Iranian illustrator Hoda Haddadi, who uses beautiful collage-style artwork to bring the family to life. It’s written by Christine Kidney who brings warmth and humour to the tale. Celebrating the importance of being yourself, and allowing others to be themselves, The New Baby and Me is the perfect book for all families, especiallly those with a little one on the way. To stay up-to-date with all news relating to The New Baby and Me or to let us know what you think of the book please use the hashtag #NewBabyandMe.